The work employs the herpes virus – the bane of so many people, but in this instance an aid to researchers – to help mimic in mice the activity of a gene that plays a role in some cases of Parkinson’s disease in people. Scientists used the virus to carry a copy of the faulty gene into mice, creating brain conditions identical to Parkinson’s disease. 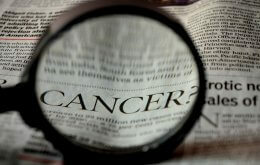 The step allowed researchers to then screen compounds in the search for one that might stop the toxicity of the gene. The team of scientists, led by investigators at Johns Hopkins University, found two promising candidates and reported its results August 22 in Nature Medicine. Top: The dark area shows a part of the mouse brain where dopamine neurons have died when toxic LRRK2 is active. Below: Dopamine neurons (in red) thrive when toxic gene activity is blocked. While the precise cause or causes of Parkinson’s remain unclear, most researchers think a combination of genetic and environmental factors is at work. The scientists targeted the molecule LRRK2, which scientists believe is the most common genetic mutation known to contribute to the disease. When LRRK2 does not work correctly in patients with Parkinson’s disease, brain cells that produce the brain chemical dopamine die. Bowers, an associate professor of Neurology and a researcher in the Center for Neural Development and Disease, used the herpes technology to reproduce the activity of a faulty version of LRRK2 in mice. The gene became active in nerve cells in the mice, killing off brain cells that make dopamine and causing symptoms in mice similar to Parkinson’s disease in people. Then the team tested 70 compounds in the laboratory and found eight that stopped the toxic activity of the errant gene. Two of the compounds were then tested in mice carrying the harmful LRRK2 gene; one compound protected nearly all of the dopamine neurons, while the second countered the toxic effects of LRRK2 in 80 percent of those neurons. The work is the latest in a series of experiments by Bowers and colleagues, who during the last decade have developed the herpes system as a way to carry genes into the nervous system and to turn them on and off at will. Herpes viruses are adept at infecting human cells – as people with cold sores, genital infections, chicken pox and shingles know so well – and scientists like Bowers use such viruses to carry into cells genes under study. Compared to other technologies, herpes has some advantages, including the ability to carry in a large “genetic payload.” In this case, that translates into genetic material of monster size – LRRK2 weighs in at 2,527 chemical building blocks, much bigger than what most other gene-delivery technologies can carry. LRRK2 is a protein kinase, a type of protein that is especially powerful because it controls the activity of other proteins. It’s especially active in a part of the cell called the mitochondria, which provides energy to cells; a great deal of recent research has pointed to a breakdown in the way mitochondria work as possibly playing a role in Parkinson’s disease. The study was led by Ted and Valina Dawson of Johns Hopkins University School of Medicine, along with first author Byoung Dae Lee of Johns Hopkins. Former Rochester researchers Howard Federoff and Kathleen Maguire-Zeiss, now at Georgetown, also participated, as did other authors from Johns Hopkins and the Mayo Clinic College of Medicine. Bowers’ work on the project was funded by the National Institute of Neurological Disorders and Stroke.